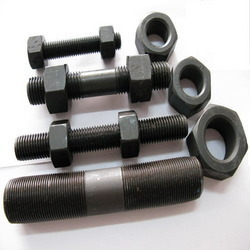 We have created a niche in the industry by offering them a wide range of Fully Threaded Stud Nuts. We use quality assured metal in the manufacturing of our Stud Nut. Also, our product is manufactured in bulk by following industrial quality norms and standards in order to ensure the quality of products. Inaugurated in the year 2004 at Ludhiana (Punjab, India), we “United Overseas Bolts”, are an ISO 9001:2008 certified Partnership based company and recognized as the prominent manufacturer, exporter and supplier of an extensive range of Industrial Fasteners, Automotive Fasteners, Structural Fasteners, Agriculture Fasteners and many more products. These products are manufactured by our adept professionals using the finest quality material in sync with the set industry norms. Also, our professionals use modern machinery and progressive technology in the manufacturing process. These products are demanded in the oil, petrochemical, power, railway, chemical and many other Industries. Offered products are demanded in the market for their high strength, simple installation, sturdiness and high durability. Owing to our prompt delivery, we have attained some renowned clients like Indian Railways, Indian Oil, LT, Hindustan Petroleum, Bharat Petroleum and BHEL.